Matabari is situated at a distance of 55 km from Agartala. One of the most important and much venerated attractions of Tripura is the ancient temple of Matabari Or Tripurasundari located on a hilltop 3 km from Udaipur. Matabari (Mother Goddess) is regarded as one of the 51 piths (holy sites) of Hindu pilgrimage. Goddess Tripurasundari is an avatar of Parvathi, the consort of Lord Shiva, the principal deity of the state. The Kalyansagar Pond that was built by Tripura’s King Dhanya Manikya of the 15th century is home to tortoises that are deeply revered by the devotees of the temple. 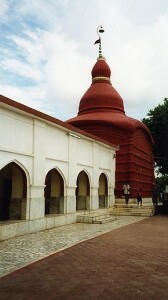 This venerable temple is also referred to as the Koorma (tortoise) Pith. The temple is 500 years old. Diwali is celebrated with great pomp here. Air: Agartala is connected with Kolkata, Guwahati and Agartala, from Kolkata to Agartala daily. Road: It is well connected with Agartala. Deotamura: Deotamura is located 20 km from Matabari and 75 km from Agartala. A panel of crude images engraved on the face of hill facing the river Gumati will welcome one in Deotamura, hill range. To approach Deotamura you have firstly to land up at Rangaamti by bus from Udaipur and thereafter have to journey by boat to arrive at Deotamura. Pilak: About 45 km away from Matabari and 100km from Agartala is Pilak, famous for its great 8th-9th century archaeological remains. The site is one of an old civilization, representing both Hindu and Buddhist linkages. The main attractions here are the massive stone sculptures of Avolokiteswara and Narasimhan and numerous carvings in stone and terracotta plaques. Trishna Wildlife Sanctuary: The bison and great residential and migratory bird population are the great attraction for visitors at The Trishna Wildlife Sanctuary, situated about 45 km from Matabari and 100 km from Agartala. It is also home to the Hoolock Gibbon, Golden Langur and Capped Langur. This entry was posted in Matabari, Tripura. Bookmark the permalink.